Calories are essential. They add weight, but they're also a measurement of energy that fuels your body and, thus, allows you to carry out daily activities. Everyone needs a minimum amount of calories to keep their heart, kidneys, lungs and other internal organs functioning, even if they sleep all day. 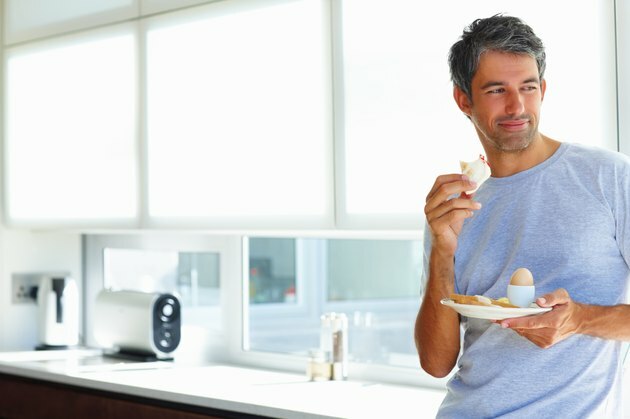 An adult man needs about 1,300 calories daily to stay alive, estimates "Essentials for Health and Wellness." How many calories he should have per day depends on his weight and activity level. Calories come from foods' carbohydrates, fat and protein. Fat provides more energy, 9 calories per gram, while carbohydrates and protein provide 4 calories per gram. However, carbohydrates are "essentially the only fuel for nervous system function" and are the "only one" you can use for stop-and-start activities, also known as anaerobic exercises, according to "Swim, Bike, Run." The U.S. Department of Agriculture recommends that you get 55 percent of your calories from carbohydrates, 29 percent from fat and 18 percent from protein. Larger men need more calories to exercise and burn more calories exercising than smaller men. A 185-pound man bicycling 13 miles per hour for one hour needs to consume 498 calories to maximize his performance, while a 155-pound man needs to consume 420, according to "Swim, Bike, Run." Men consuming fewer calories risk exhaustion and getting hurt when they strive to improve a subpar performance. The 185-pound man burns 710 calories bicycling 13 miles per hour for one hour; the 155-pound man burns 596, according to the Harvard Heart Letter's July 2004 issue. "An Invitation to Health," a college textbook, estimates how many calories adult males need daily if they're active. High-activity men exercise 60 minutes per day, while medium-activity men exercise 30 minutes daily. A 187-pound high-activity man needs to consume 3,300 calories; a 187-pound medium-activity man needs 3,100. A 165-pound high-activity man needs to consume 3,100 calories; a 165-lb. medium-activity man needs 2,800. A 143-pound high-activity man needs to consume 2,700 calories; a 143-pound medium-activity man needs 2,400. Adult males eating 1,300 calories daily can survive, but should eat more, even if they don't exercise, according to "Invitation" author Dianne Hales. Low-activity men who are 187, 165 and 143 pounds "need" 2,600, 2,400 and 2,050 calories daily, respectively. Men who want to lose weight should know that exercise speeds your metabolism, dieting without exercise slows your metabolism and you need to burn 3,500 more calories than you consume to lose 1 pound. Adult males need far more calories than adult females who weigh the same because fueling muscles requires more calories than fueling fat, and the average man has "roughly twice the percentage of muscle mass and half the percentage of body fat" than the average woman, although he weighs only 10 to 15 percent more, according to "Invitation." A 165-pound low-activity man needs 2,400 calories daily, while a 165-lb. low-activity woman needs 1,950. A 121-lb. high-activity man and woman need 2,400 and 2,000 calories per day, respectively.